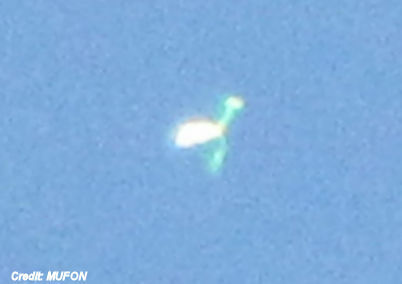 A witness in Poços de Caldas, Brazil captured a video of a strange looking object he cannot identify. The witness reported the object to the Mutual UFO Network (MUFON) along with still images and video. The sighting took place on August 6, 2017. The witness claims to have noticed two bright star-like objects moving across the sky, even though it was during the day and still light out. It was still day, and I saw two bright and strong lights, looking like stars. But no other star appeared, and it was too soon for them to appear. They moved together in a constant trajectory, not fast, not slow… and in the same direction (SE to NE), and really far away. Constant brightness all the time. One of them was bigger and brighter, and other smaller, but still bright. This small one disappeared suddenly, but the bigger kept on moving. They passed over right above me. Strange because it was to UFOs, very bright all the time… (sun reflection not the case). I took a picture of a plane passing by, with maximum close up from my camera. The same close with I took the pictures. I changed ISO, so some pictures were darkened. And at the end of the mp4, there is the video.